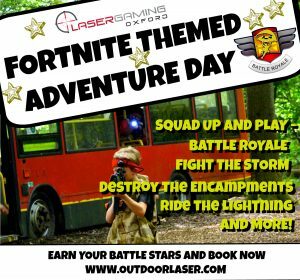 Lasergaming Full Day Adventure’s – You’ve seen the movies, you’ve played the games, now live em………..
For children aged 8-16 years only – No adults required! Squad up and play Battle Royale LIVE on the Battlefield in 2019! Our FORTNITE themed adventure days get the kids off their consoles, off the sofa and outdoors into the fresh air whilst playing their favourite games! Battle Royale LIVE – Gear up with one of our gaming guns – with 12 to choose from there is something for everyone! Outdoor holiday Fun & Friendship – perfect adventures to get the kids outdoors this summer! ces these days such as XBox’s, PS4’s, Ipad’s and interactive consoles, when it comes to arranging half term and summer holiday activities, the same old holiday camp with football, swimming and a bit of survival just isn’t going to get the kids off the sofa, off their gaming consoles and out in the fresh air. It’s our mission to get as many kids out, in the fresh air having fun as possible. Our Lasergaming Adventure days are the ULTIMATE, authentic live combat gaming experiences where its like being in a real computer game but the players are part of the game. Our games are based on the very latest games being played on the XBOX, PS4 and PC. No 2 days are the same. On Arrival you will hand in your disclaimer forms to the commanding officer. You will then be briefed on the session ahead and begin kit up and weapon issue. Once you are ready the safety brief will begin and weapons training will commence. We will then form the teams and give you your first mission and send you on your way. This usually takes approximately 30 minutes in total. Throughout the rest of the morning session, other mission objectives will be given to you and you will continue gaming until the end of the morning session. The games are pretty full on and immersive so it will be action packed. We will then break for lunch where a selection of hot food, Woodfired Pizza’s and refreshments are available to buy from the Forest Cafe. After Lunch we will then be playing some of our advanced missions we which we don’t usually get to play in our birthday party sessions as time doesn’t permit. These advanced ops specifically for our adventure day players require team strategy, communication and tactics and are awesome missions that the kids will love. We also use bigger areas to play the missions and the kids will be immersed in game play for hours. 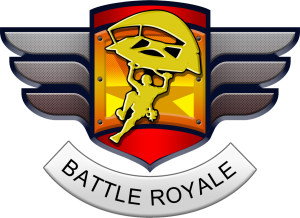 FORTNITE themed Adventure Day –Play Battle Royale LIVE on the Battlefield in 2019! Below are a collection of questions other people have asked in the hope that this can be of help in the future. Is this suitable for girls? Absolutely YES! The girls LOVE Lasergaming, there is NO paint, NO projectiles, No Pain, NO bruises, NO masks and NO protective clothing needed just to play. We have 8 different gaming guns to choose from so we have the light weight SMG’s that are only 2kg and we also have the big guns that weight 4kg so something for everyone in team. The way our games are structured it isn’t all about who is the fastest and strongest, there are many roles within the team and girls LOVE Lasergaming because they feel they can join in the fun without being covered in bruises the next day! Do we play with the people we book with? Yes, when you arrive and we split the teams up we will ask you to stand with the people you want to stay with, we will then bunch lots of small groups into 2-4 main teams so you get to stay with your friends. You can book individual places for our adventure days or multiple places. There isn't a minimum number for booking. Can we provisionally book places? Unfortunately we do not offer provisional bookings as all our bookings are offered online on a first come first served basis. We do get booked up very quickly so we recommend booking as soon as possible. Depending on the time of year players will need to wear appropriate outdoor clothing - there is no such thing as bad weather just bad clothing! For winter months we recommend warm layered clothing, waterproof coat/Jacket, old clothes you don't mind getting muddy and grubby in the woodland, trainers or walking boots only - no open toed/open heeled shoes. Shoes must have adequate ankle support for outdoor use. Thin gloves, and anything else to keep players warm. In summer months we recommend long trousers (we are a woodland and insects live int he woodland), long sleeved t-shirt, trainers or walking boots only - no open toed/open heeled shoes. Shoes must have adequate ankle support for outdoor use. You may wish to bring a thick waterproof coat if raining. We recommend sunscreen and insect repellent. The minimum age for our adventure days is 8 years old. In line with our insurance and health and safety policies, we can not accommodate 7 year olds under any circumstances. This includes children who are nearly 8. The maximum age for adventure days is 16 years old. Is there somewhere to park when dropping off the kids? Yes we have plenty of FREE parking and also coach and minibus parking. Players and visitors park at their own risk. Please note Lasergaming UK Ltd does not accept liability for any loss or damage to motor vehicles, their accessories or contents whilst parked in our carpark. Please leave all valuables at home and take care when entering and exiting the carpark as children are around. Please note Dogs are Not allowed in the woodland. No, In line with our child protection policies, Parents do not stay on site, our kids adventure days are for kids only! Parents drop the kids off and then pick them up at the end of the day. Abingdon town centre is 2 miles away, Didcot 4 miles and Oxford city 8 miles should you want to do some shopping whilst waiting. Do I need to sign a disclaimer for my child? Our Disclaimer forms require the parent to confirm that they do not know of any medical condition that their child suffers from which might have the effect of making it more likely that whilst under our care, the player be involved in an incident, which could result in injury to themselves or others. This includes epilepsy, seizures, convulsions, Asthma, Back problems, recent injuries and other conditions. In the event a participant discloses a medical condition, we would recommend they have written consent or obtained medical guidance from their doctor to take part in the activities. With good preparation and management of the session, it is not very often players can not take part, it is better to call us and check beforehand if there is anything you are unsure about so we can make preparations for that particular player, conduct the necessary risk assessments and check suitability in line with our company policies rather than them turn up on the day, and they can not take part due lack of time for preparation for medical conditions and injuries. They will also need time to check with their GP. If we have recommended you check suitability or you disclose a medical condition, injury on the day on your disclaimer which we think increases the risk by you participating in our activities, we will ask you to sign an additional disclaimer if we allow the child to take part. To book your session pop over to our book online tab and select Adventure days. Add the dates to the cart you wish to attend and check out. To secure the booking you will need to pay in full at the time of booking. Payment can be made by credit or debit card. Can I increase numbers nearer the time? Yes of course subject to availability, you can pop back online anytime and check to see if there is space and if so book online. Please note however our adventure days get booked up quickly. What happens if I book and then my child can't make it? If your booking is 30 days or more prior to the adventure day then you will receive a refund. If the booking is for 30 days or less prior to the adventure day then unfortunately no refunds will be given for no shows, late notice cancellations or on the day illness's. The places are transferable for the same day so another child can come instead BUT they are not transferable to alternative dates. To keep the costs down for all parents, we do not provide travel insurance or insurance for bookings that covers on the day illness's or late notice cancellations. Drop off is from 9.50am for a 10am start and pick up at 5.30pm promptly. On Arrival in the morning, please walk up to the forest shelter and sign your child in. Pick up is also from the forest shelter where you will need to sign your child out. Food is available from the Forest Cafe, this includes burgers, Pizza, hot and cold drinks for an additional cost. From February 2016, players can also purchase wood fired pizza cooked in our authentic italian pizza oven in the woodland for an additional cost. Yes, you certainly can. The dogtags are part of our adventure day ranking system so players can earn their ranks and progress the more they play. Dogtags are £3.99 each and players will receive player perks depending on their rank in game. Dogtags can be pre-ordered at the time of booking or ordered on the day.